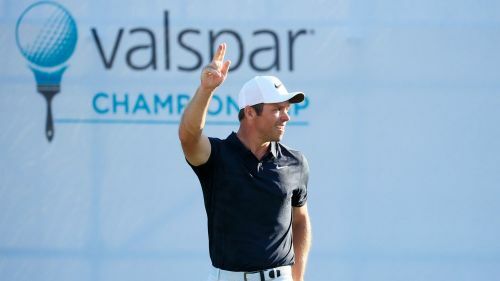 Paul Casey became the first player to retain the Valspar Championship as he finished one stroke ahead of the chasing pack at Palm Harbor. The Englishman, who started the final round just one shot clear of world number one Dustin Johnson, signed for a 72 and that proved enough to edge out Louis Oosthuizen and Jason Kokrak by the narrowest of margins. It is also the same thin cushion that Casey had over Tiger Woods and Patrick Reed when he prevailed at Innisbrook last year. Playing partner Johnson, meanwhile, fell out of contention after an untidy three-over-par 74 as the two leading contenders shot their worst scores of the week. Kokrak, who has never won on the PGA Tour, will be left to rue a bogey at the last which ultimately denied him a share of the lead. The capricious winds and firm putting surfaces presented a difficult challenge on Sunday and even the best struggled to cope, with Johnson failing to make a birdie for the first time in 31 tournaments. Casey's own bid for glory appeared to be faltering when he carded three bogeys across five holes on the front nine, but the 2018 Ryder Cup star kept his cool. His birdie at the par-five 11th got him back to level par for the round and he quickly offset a bogey at the 13th with another gain on the next hole. A nervy three-putt on the penultimate green could have been more damaging than it turned out to be, with Casey's closing tap-in par getting the job done in Florida.